Coach Mike D'Antoni's rotation is an ever-evolving machine with parts that grow, shrink, disappear, and switch roles constantly. As part of our Knicks coverage all season, we'll be tracking each player every Tuesday. Come join us for the Knicks Power Rankings! 1. Tyson Chandler. (Last week: 2) The Knicks have lost six consecutive games, including three straight — all at Madison Square Garden — since we last spoke. New York fans are as agitated as they've been since, well, the last time they were very agitated, which was very recently. There had been some encouragement in the first game of that home stand, with only an otherworldly shooting performance by the Magic standing between a Knick loss and a Knick win over an elite team. Any momentum generated therein soon dissipated, though, as New York got thoroughly trod upon by the bottom-dwelling Suns and Bucks, then exerted themselves in vain in a double-overtime loss to the Nuggets. That kind of futility, especially during a precious weeklong home stand, wears on a Knicks fan, and gets one tasked with ranking the "Power" of these Knicks feeling a little existential. Late Saturday night, still feverish in the aftermath of Knicks-Nuggets, I got to wondering about what power really means in this context, and realized that I'd never quite bothered to define power, nor had I established clear parameters by which to appraise it. I went on a low-key, couch-based vision quest, plumbing the depths of my soul and even combing through the scripture of my ancestors in search of guidance. I found very little in the way of answers, but I feel ready to proclaim the following: Even in the worst of weeks, something must go right for the Knicks, else they'd lose 200-0 each night (not outside the realm of possibility, but it hasn't happened yet). Thus, these rankings of power, to me, are an ordered list of those Knicks who I feel contributed most to whatever success — be it modest or magnificent — the Knicks have had of late. 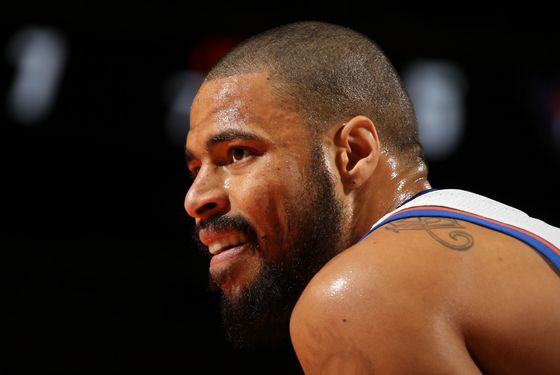 Anyway, the Knicks really sucked this past week, but Tyson Chandler played pretty well. The tall fellow's interior presence, rebounding, and unwavering rancor over New York's struggles are both heartening to fans and integral to New York's creepily well-ranked defense. On the court, Chandler appears genuinely irate that his team can't put one foot in front of the other, and it seems to motivate him to take matters of defense into his own hands — a burden he bears with remarkable aplomb. Meanwhile, Chandler remains frequently open on offense, but with nobody around who's committed to finding him inside, he's devolved into something of an obstacle for the attacking Amar'e Stoudemire. So, yeah, my number-one-ranked New York player right now is somebody who helps on defense but, with no point guard to engage him, is essentially a traffic cone on offense. The Knicks! Immediately after that aggravating Denver game, which was particularly resonant for obvious reasons, Anthony sounded somewhat contrite, but went on to withdraw his remorse the next day. It'll be very interesting to see if even that ephemeral expression of self-awareness foretold some willingness to adapt. Knicks fans, ever skeptical, will be watching him very closely in the coming week. 4. Iman Shumpert. (Last week: 4) Shump's a rookie, so the on-and-off performances we've seen from him are to be expected. That said, Iman reined in his shooting a bit this past week and had a couple solid offensive outings, including a career-high twenty points against the Suns. He's looking more and more calibrated to defend shooting guards instead of point guards, but continues to provide at least a couple pick-six steal–fast break combinations a night. His 2.58 steals a game are second only to Chris Paul in the NBA larceny rankins. 5. Josh Harrellson. (Last week: 3) The desperate need for three-point accuracy only got graver when Harrellson fell and fractured his wrist during Saturday's game against the Nuggets (he appeared fine at the time and actually went on to attempt another three). Jorts had successful surgery to repair his wrist today, which means the Knicks will have to go six-odd weeks without their most reliable three-point shooter and best defending-rebounding force off the bench (though I'm kind of expecting Harrellson to rub some mud on his surgical scars, wrap the whole thing in denim, and get right back on the court). 6. Amar'e Stoudemire. (Last week: 5) It's eerie to see such an imposing individual look so completely feeble. Stoudemire's touches are all wrong, his shots won't fall, his defense is as meek as ever, and even his on-screen romance with Ivana Humpalot looks stilted. Knicks fans pray and pray (I've actually been making periodic animal sacrifices as well) that Baron Davis's presence will serve to guide and enliven Stoudemire in such a way that he can wield his incredible offensive potential anew, even with Chandler sharing the floor. And hey, Davis is a movie producer off the court. Maybe he can remedy Stoudemire's acting, too. 7. Bill Walker. (Last week: 9) Walker gets one boost in the rankings for leading the team in first-half scoring against the Nuggets, and gets another little boost for referring to Al Trautwig as "chief" during the ensuing halftime interview. 8. Jared Jeffries. (Last week: 7) Jeffries, wearing an exceedingly wide, almost bandagelike white headband, was seen to attempt and convert a long two-point jumper during Saturday's game. One can only assume that Jared sustained some sort of blunt trauma to his cerebral cortex that incited spiritual transcendence and total personality change, and that Jeffries has been reborn as a perimeter marksman. Made jumpers from Jared Jeffries don't just happen. 9. Toney Douglas. (Last week: 8) After looking a bit bolder and more effective heading into last week's rankings, Toney regressed and offered very little this past week. 10. Mike Bibby. (Last week: 10) Game logs suggest that Bibby participated in basketball games this week, but I have no visual recollections to confirm that suggestion. 11. Steve Novak. (Last week: 12) Novak (and everybody below him) has not touched the floor in a week, but with Harrellson out and Novak the only other guy who might be counted upon to hit an open three-pointer, there may be some minutes in this bro's future. 12. Renaldo Balkman. (Last week: 11) These days, a week without any minutes for Humpty means a week in which the Knicks neither won convincingly nor lost promptly enough to invite garbage time, which is a sorry week indeed. 13. Jeremy Lin. (Last week: 14) Since last week's rankings, Lin and Jerome Jordan were sent to and recalled from the Knicks' D-League affiliate in Erie. And hey, Jeremy notched a quick triple-double while he was over there! 14. Jerome Jordan. (Last week: 13) Despite his companion being the one to put up the best numbers in Erie, Jordan seems more likely to earn minutes now that they've returned with the Knicks. Given Harrellson's absence and Stoudemire's propensity for foul trouble, Jordan could get called upon as an emergency big man.